London – To celebrate the 50th Anniversary of Goldfinger, EON Productions has commissioned a one-off gold-plated third scale replica of James Bond’s iconic Aston Martin DB5 which Christie’s will offer in a special online auction to benefit the NSPCC. The replica DB5 has been signed by legendary Bond Production Designer Sir Ken Adam, who designed the Q branch modifications to the car for Sean Connery as agent 007 in 1964’s Goldfinger. Prop-makers Propshop, who manufactured the scale model DB5’s required for special effect scenes in Skyfall using 3D scans of the full size DB5, have created a one-off gold model with 24 carat gold plated detailing, complete with radio controlled machine guns, bullet proof shield and revolving number plate. 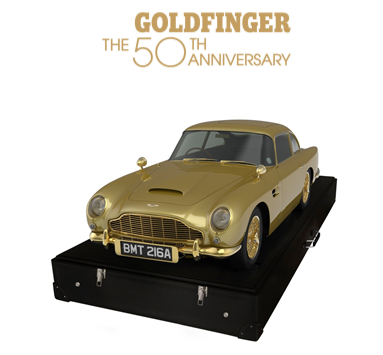 The unique Goldfinger model is expected to sell for between £40,000-60,000 ($66,000-100,000) and will be available for bidding online from 8th September at http://www.christies.com/goldfinger, with bidding closing on 17th September, the 50th Anniversary of the World Premiere of Goldfinger. I am sure that there will be some stiff competion for this and it is certainly for a very good cause. Good luck! This entry was posted in Cinema History, Visual Arts and tagged Aston Martin, Goldfinger, James Bond, Visual Arts.